Taproom on 19th is celebrating National Watermelon Day with a new salad. Watermelon is the ultimate summer food. It's refreshing, it's juicy, and it's easy to add to numerous dishes and drinks. This summer, get your watermelon fix at one of the local spots below. There are salads, cocktails and ceviche to try. Bonefish Grill is celebrating National Watermelon Day on Thursday, Aug. 3, by offering $5 watermelon martinis at all participating locations. The drink is made with hand-muddled watermelon, cucumber-infused vodka and fresh sour mix, then garnished with frozen watermelon cubes. To make the drink at home, use 1.5 ounces of vodka, two cucumber slices, 0.25 ounces of simple syrup, 0.5 ounces of fresh sour mix and two pieces of fresh watermelon. Devil's Den is throwing a National Watermelon Day party from 5 p.m. to 11 p.m.
Dine on watermelon specials, like a new salad made with watermelon, arugula, sea salt and cotija cheese. The bar will have 21st Amendment Brewery's Hell or High Watermelon in cans and 21st Amendment Watermelon Funk, Ballast Point Watermelon Dorado and Terrapin Watermelon Gose on draft. There will be boozy watermelon popsicles and a watermelon mimosa, too. Jet Wine Bar's summer ceviche is perfect for a hot day. Halibut, watermelon, jalapeño, cucumber, red onion and tomato make up the seafood dish. This salad will be served during brunch, lunch and dinner at The Twisted Tail. It's made with fresh watermelon and heirloom tomatoes with a Parmesan vinaigrette. Soak up the sun at the outdoor bar at Morgan's Pier while sipping on a Watermelon Ricky. The drink is made with 21st Amendment Ale and watermelon puree. On Thursday, Aug. 3, at 5 p.m., the Great Greased Watermelon Race will take place on the bar's patio. The race/obstacle course will be supplemented with watermelon-themed beers from 21st Amendment, Terrapin and more. 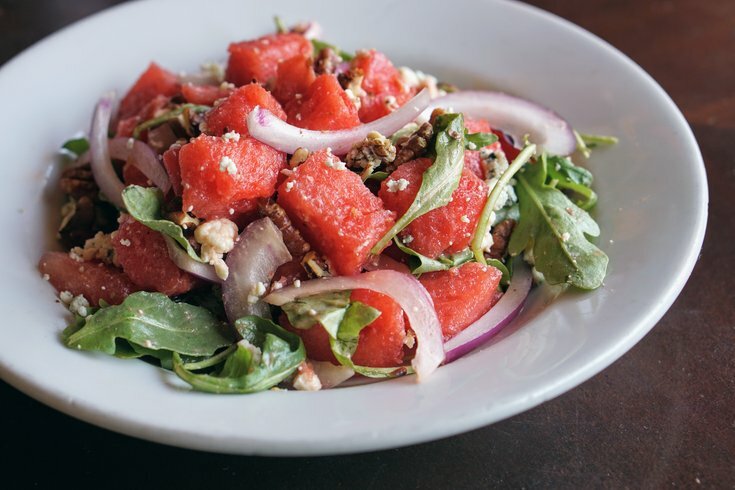 City Tap House also offers a spicy watermelon margarita and a grilled watermelon salad with feta, black berries, red onion, radish, arugula, cherry tomato and cilantro lime vinaigrette. The Watermelon Elyx cocktail features Absolute Elyx, Uncle Val’s gin, basil simple syrup, watermelon puree, lime juice and ginger bitters. Bridget Foy’s celebrates summer with the return of the Watermelon Mint Collins. This seasonal twist on the standard Tom Collins is made with a vodka or gin base, juicy watermelon, mint and lemon, then topped with club soda. On Thursday, Aug. 3, it will be $5. Try the new Waterloo cocktail, which is made with Plymouth Gin, Campari, lemon juice and fresh watermelon. Taproom on 19th celebrates National Watermelon Day with the new Watermelon Bleu Cheese Salad. The dish is made with fresh watermelon, bleu cheese crumbles, red onion and toasted pecans. It will be available all weekend but will be discounted on Thursday, Aug. 3.